The current spate of attacks in South Africa targeting African immigrants is threatening to spiral out of control as ransacking of shops and harassing of foreigners continue unabated. 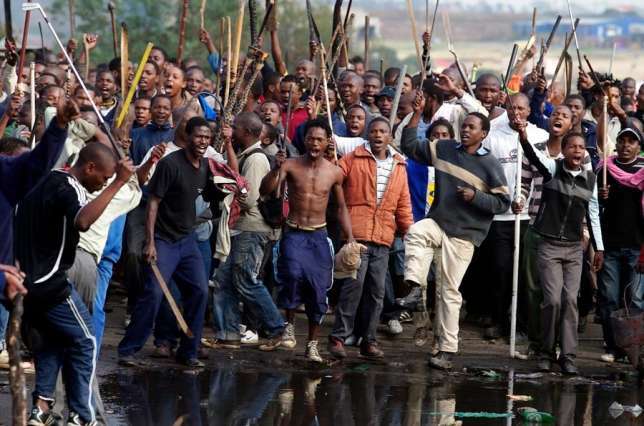 “The Mamelodi Concerned Residents” that has become the face of the current xenophobic attacks have carried daring attacks on businesses run by foreigners in what they claim is venting anger on non-South Africans, predominantly Nigerians, Zimbabweans and Somalis who, have settled in the Rainbow republic and taken over the locals’ jobs. The attacks have rekindled memories of similar attacks that have always taken an ugly twist. In 2015 seven people died as a result of the same, with the 2008 ones being the bloodiest, having claimed 60 lives and displaced over 50,000 people. South Africa’s president Jacob Zuma has, as before, condemned the attacks. “We are not a xenophobic country. At the same time, we cannot close our eyes to the concerns of the communities that most of the crimes such as drug dealing, prostitution and human trafficking are allegedly perpetuated by foreign nationals.” He said in a statement. But this statement is one among many critics feel do nothing to address the root cause of this mayhem. For a country that is home to over two million foreigners and one that prides itself in tolerance, diversity, co-existence and being a beacon of civility in the continent, such regrettable acts not only paint it in bad light, but will always inspire retaliatory attacks. Already in Nigeria’s capital Abuja, protesters have attacked South Africa telecommunication company MTN’s office to protest attacks on their nationals. The Nigerian government on the other hand has summoned the South African ambassador to express their discontent over the attacks. To have foreigners live in constant fear while in another African country is regrettable and flies in the face of the United African resolve that is now being actualized with the introduction of a United African passport and key resolutions that will open borders for Africans to move freely and do business together. No African country can claim to make it on its own as past experiences have shown. Any attempts to attack foreigners should be met with the requisite force, with the responsible governments moving beyond rhetoric to prove to the rest of Africa that they are committed to a borderless Africa that embraces coexistence. Accommodating foreigners will be every government’s litmus test and for South Africa, the herculean task now is to shed off the xenophobic country tag while proving to the rest of the continent that it indeed embraces the ideals of one African people.